It was propped up on a work table with a second coat of paint on it. 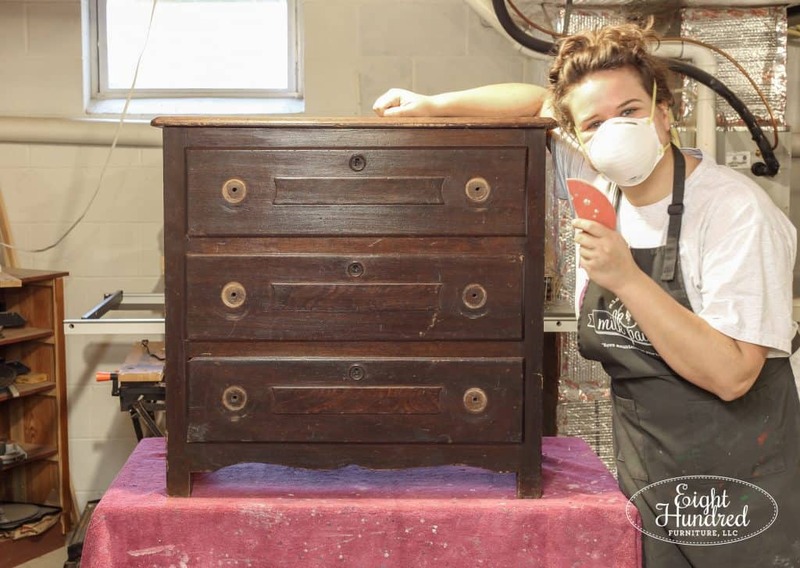 I started the makeover process by taking off the incredible Victorian ebony wood drop pulls and gave the piece a good scuff with 120 grit sandpaper. 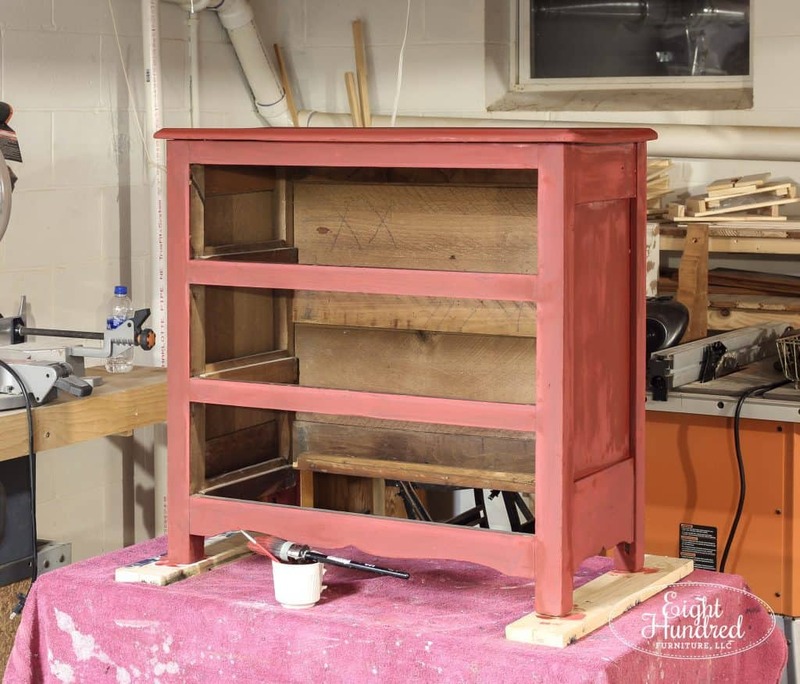 After it was cleaned off, I mixed up 1 part Tricycle with half a part of Curio by Miss Mustard Seed’s Milk Paint. 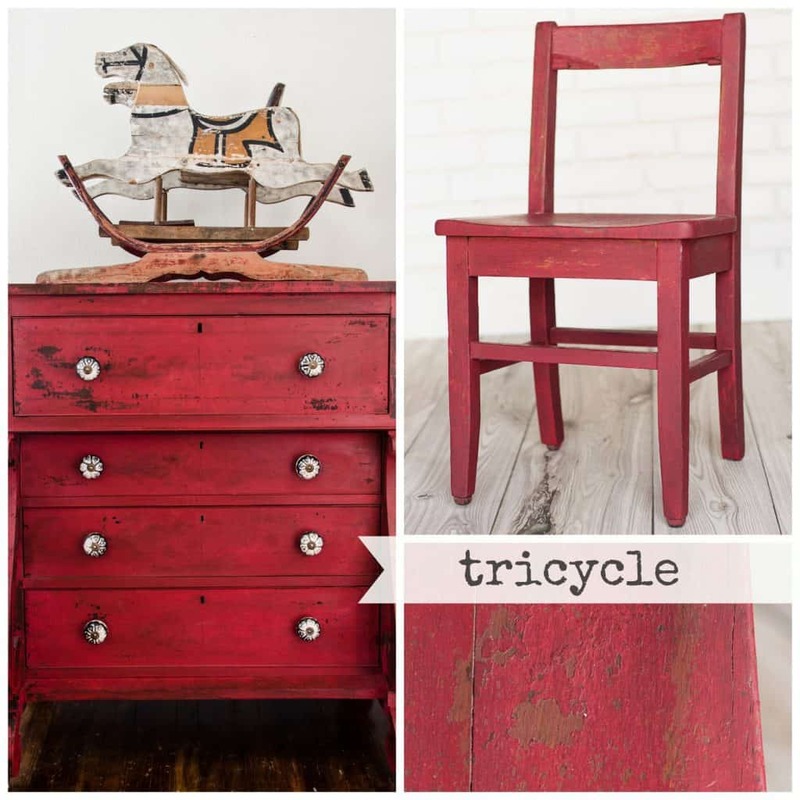 Tricycle is a very beautiful shade of red. It looks fabulous when used straight out of the bag, but I wanted to darken it a bit so it wasn’t so vibrant. I thought a more muted tone of red would look nice on my piece, so I added a touch of Curio. I didn’t measure how much I put in exactly, but it was a little bit less than one part. 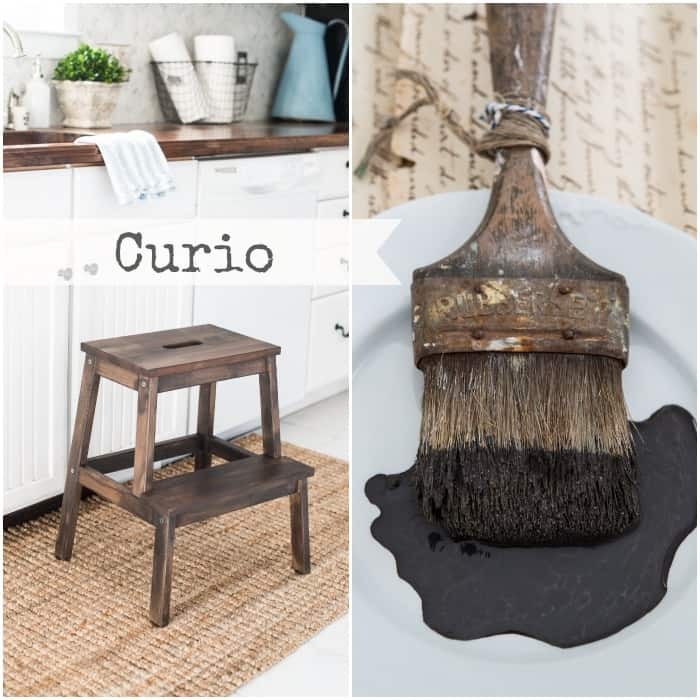 Curio is a deliciously rich chocolate brown that is very versatile. 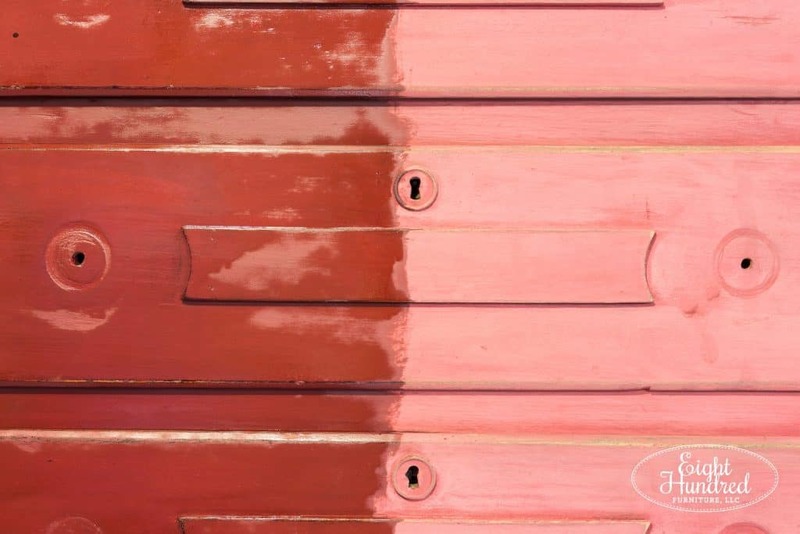 It can be mixed thin to serve as a stain, and it can be mixed in with other colors (like Tricycle) to darken them. It also happens to be one the MMSMP Featured Colors of the Month for November! 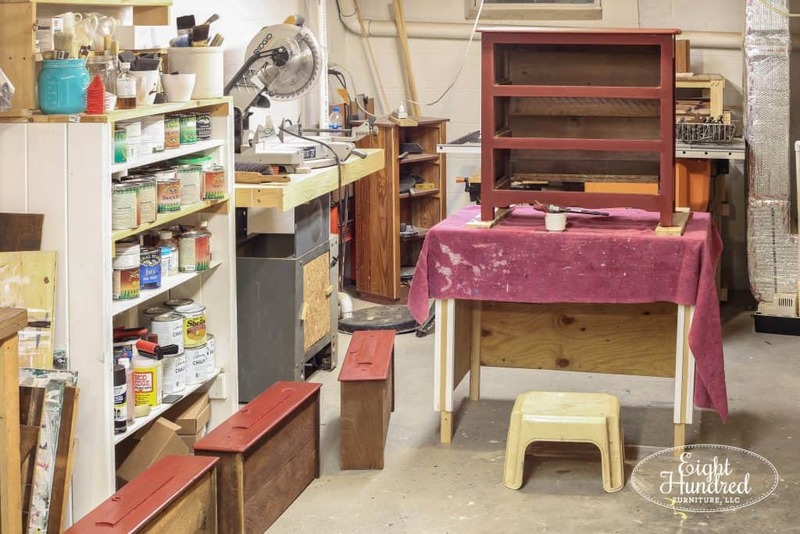 I applied two coats of my custom red mixture and smooth sanded with 400 grit sandpaper. 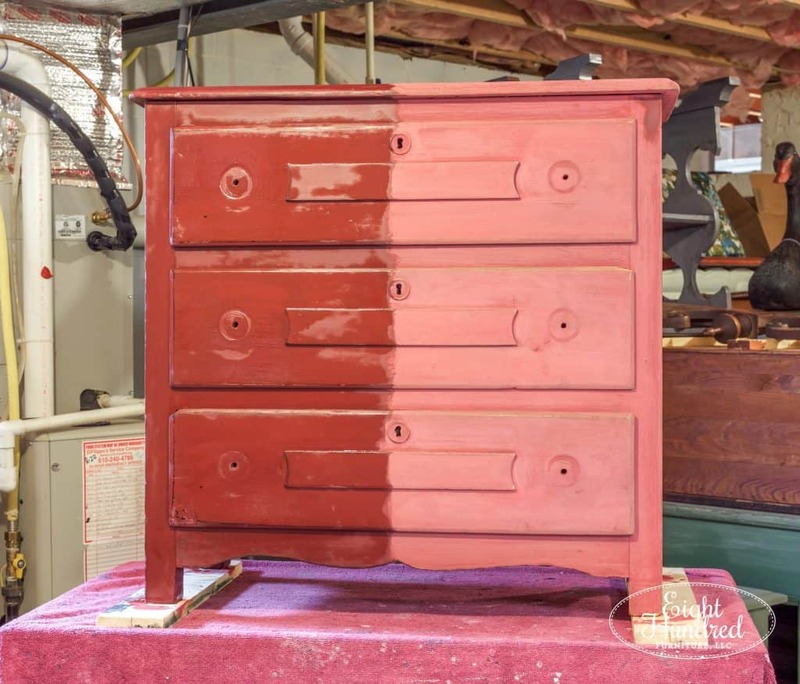 This step really helps to knock down the gritty feeling that you can sometimes experience when using Miss Mustard Seed’s Milk Paint. 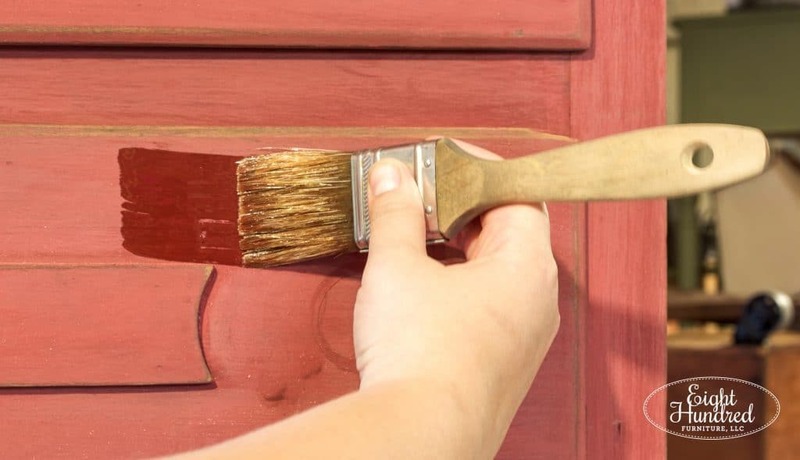 Because it’s a powdered paint that is mixed with water, it does not have the ultra smooth consistency that pre-mixed modern paints do. 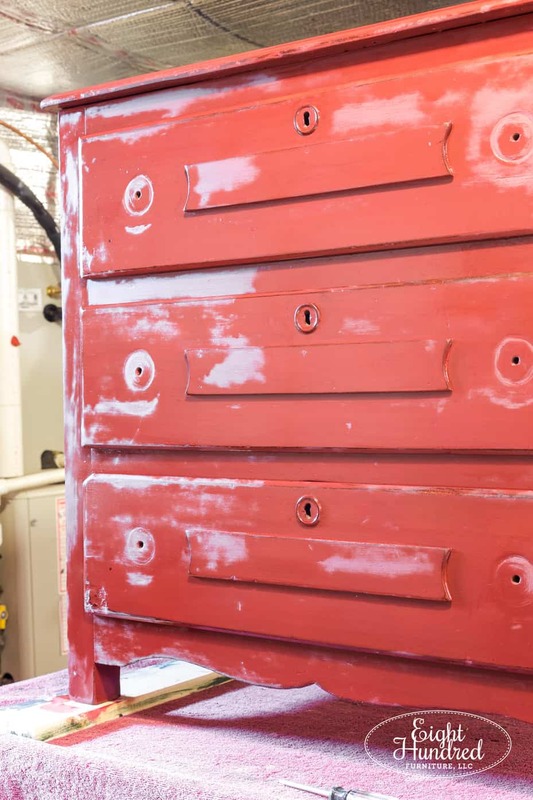 But all it takes is a simple finish sanding with a fine grit and you’re good to go! After smooth sanding, I went back with 100 grit and distressed more aggressively around the edges of the piece. Tricycle looks incredible when it’s topped with Hemp Oil, so I poured out a generous amount into a cup and went to work. You can see the night and day difference that Hemp Oil makes! 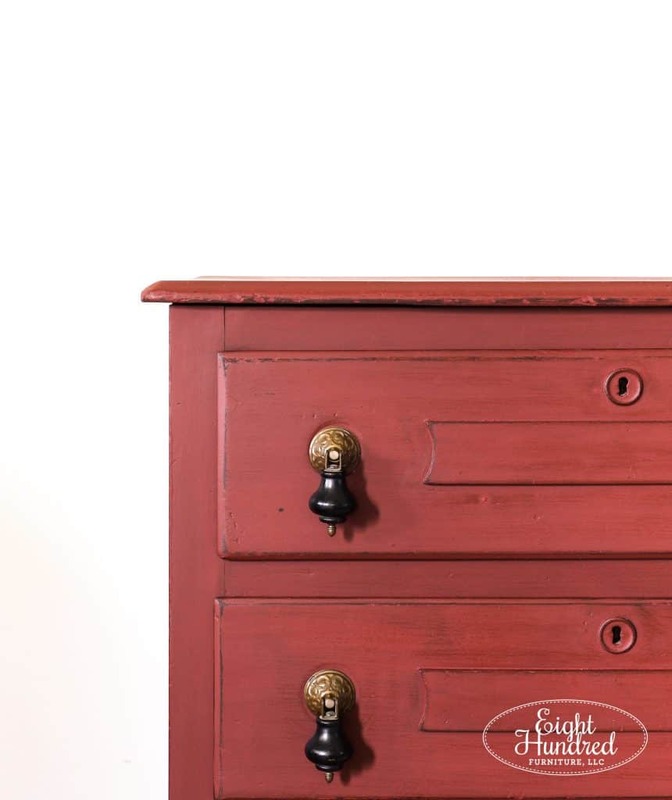 It really wakes up the vibrant color of Milk Paint (especially the darker shades). The piece looked like a whole new creation! Once the Hemp Oil was applied all over, I let it sit for about an hour to give it a chance to soak in. That’s what all of the blotchy spots are. Hemp Oil soaks in at different rates across the surface of a piece. Some spots are much more dry than others, so the splotches simply indicate different absorption rates. After an hour, I went over the entire piece with a lint-free rag and wiped back whatever excess oil hadn’t soaked in. 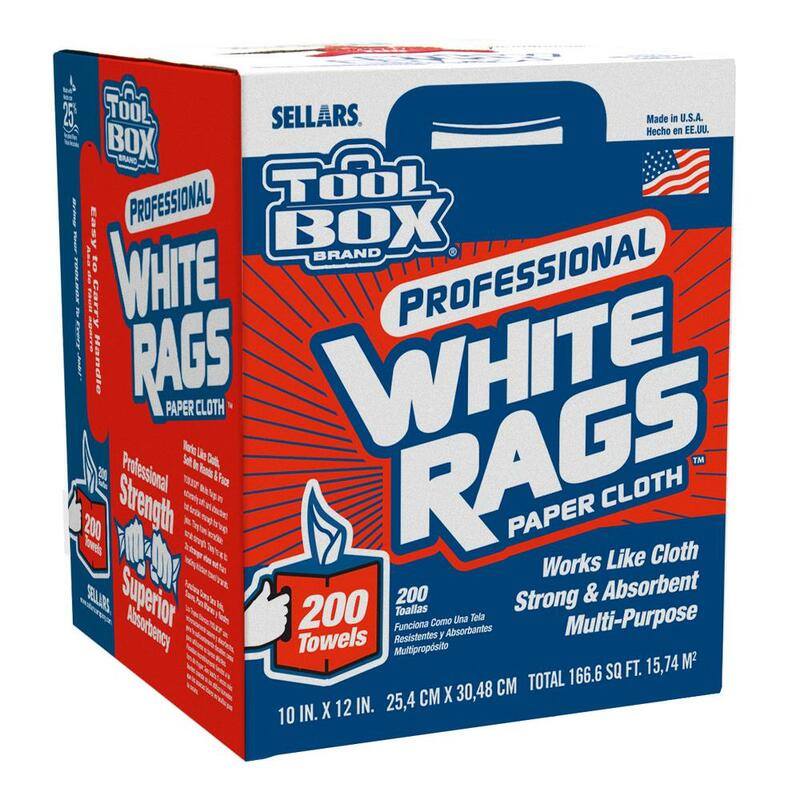 These are my favorite rags to use. I really REALLY like this color! 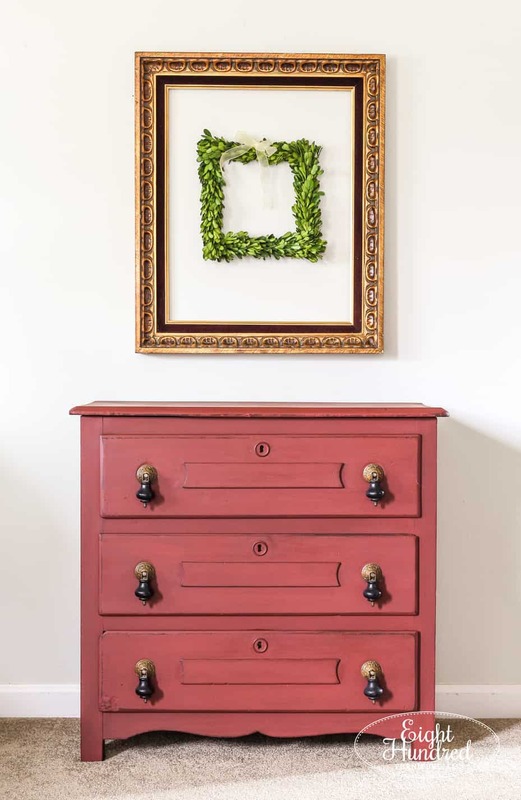 It’s got the classic feel of red with a toned down hint of that rich brown, Curio. The drop pulls look fantastic resting up against it. 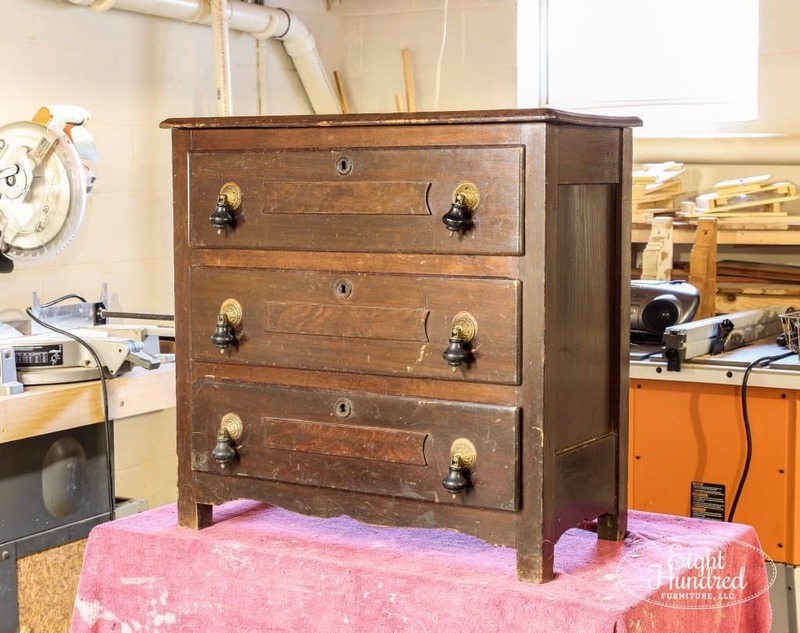 I went a bit heavy handed with the distressing around the edges to give this piece more of an aged rustic feel. The wood that I exposed instantly darkened and hydrated when I applied the Hemp Oil. 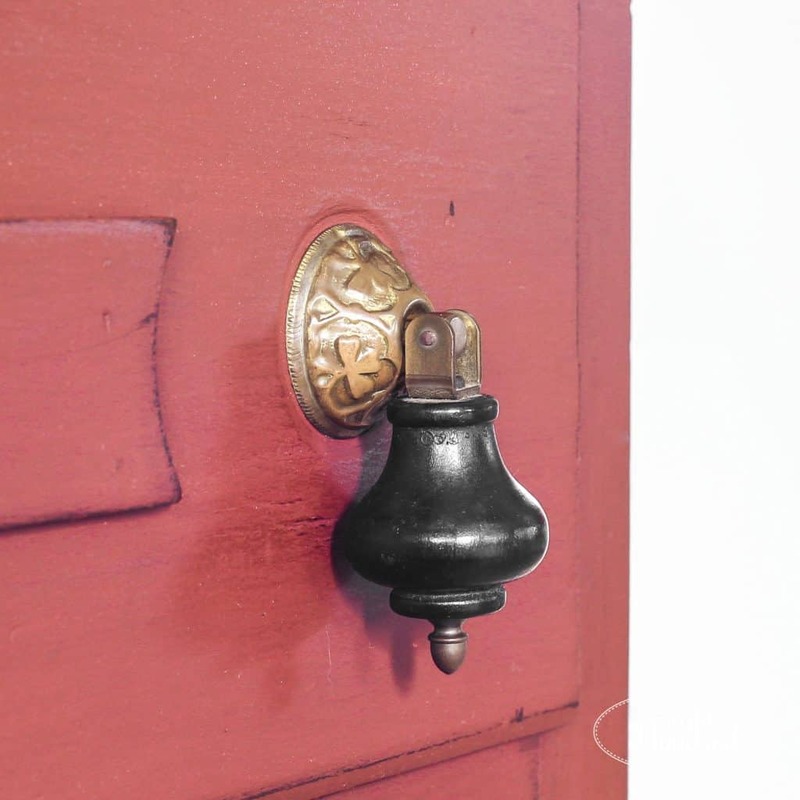 The pulls remind me of little bells just waiting to be rung! 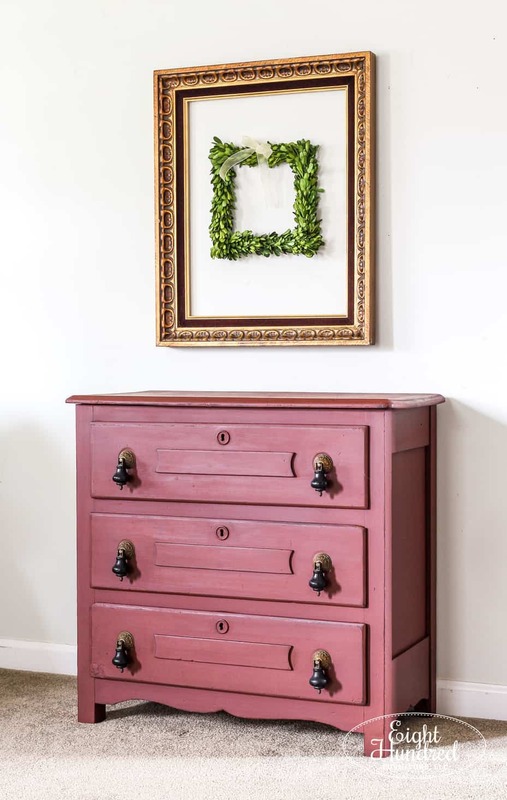 The shape of this little chest of drawers is too cute. 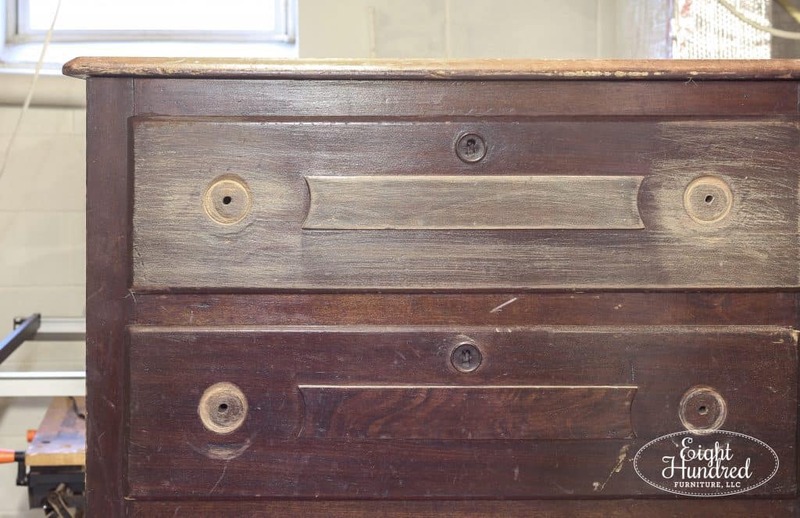 I love the sweeping curves of the base and the raised panels on the drawers. This piece is currently in my “on deck” stash but it’s available to be purchased if you’re interested. Message me for details! 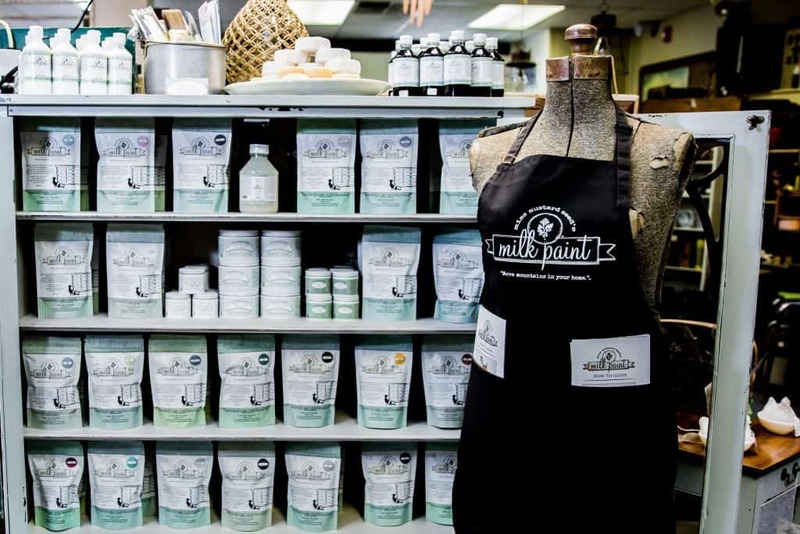 You can purchase Hemp Oil, Tricycle and Curio from my MMS Milk Paint display at Morgantown Market if you’d like to recreate this look for yourself.